Originally published at A CLOSER LISTEN. 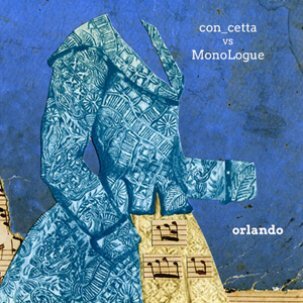 The ever-reliable Time Released Sound label kicked off 2014 in strong fashion with Orlando, a unique collaboration billed as con_cetta vs MonoLogue. Though conceptually interesting and certainly enriched by an understanding of its context, the album stands as a beautiful work on its own. The use of music in the cinema is so popular that for decades the Original Soundtrack (OST) has been a recognized form of musical work in its own right. Instrumental music has been plagued by references to the “imaginary soundtrack” as a touchstone that listeners can relate to, so much so that “cinematic” has become one of the most tired clichés in music journalism. Yet sometimes a musical work is aided by linking its structure to another work. Some artists have explicitly set out to re-imagine the scores to classic films, such as Daníel Bjarnason and Ben Frost’s reinterpretation of Solaris. Others have found inspiration in the era of silent film, in which live musical accompaniment was often a common feature. Satan is my Brother’s A Forest Dark, for instance, began as a live soundtrack to the 1911 premiere Italian silent film, Inferno, and the many works of Dublin’s 3epkano are all scores to silent films. Their performances include visual accompaniment, of course, but it remains a contentious subject as to how to interpret a soundtrack devoid of the context of the film. Should a listener understand the context of a film in order to best relate to the music? As a soundtrack to a novel Orlando is something quite unique, and knowledge of the novel certainly reveals layers of meaning that would be otherwise opaque. Though albums have often been inspired by a novel, such as Lawrence English’s The Peregrine, I don’t know of any albums that have been created specifically to accompany the reading of one in particular. I’m sure this release isn’t without precedent, but it’s the first time I’ve sat down and read a novel with a soundtrack designed for that purpose, for that particular work. The nature of the novel itself makes the format of this album all the more significant. The opposition implied by the ‘versus’ underscores the duality that is at the heart of Virginia Woolf’s Orlando: A Biography (1928). Like the novel itself, Orlando is full of dichotomies that revel in ambiguity in ways such as to problematize reductive dichotomies. Structurally, the album alternates tracks between the two artists, Giuseppe Cordaro (con_cetta) and Maria Sarri (MonoLogue, Marie e le Rose, Moon Ra). Though the two have previously collaborated under another name, it feels appropriate for this soundtrack to emphasize their individuality. The two have many credits as musicians, sound designers and composers, and each have worked with other collaborators (Giorgio Sancristoforo, Danny Boom, Ben Frost, Giardini di Mirò, Giuseppe La Spada, among many others). Perhaps as a result of their constantly shifting work habits, Orlando is remarkable for its lucidity and consistency. The music is tonal and melodic, full of texture and ambience. The reliance on repetition lends itself to reading, and the use of simultaneous field-recordings deepens one’s immersion without distracting from the text the way the introduction of legible speech or lyrics would. Now, to set up the context a bit: Though not one of Woolf’s better known novels to the general public, Orlando is famous for being one of the best (explicit) treatments of gender by a female writer, and has since become particularly important in the history of gender and transgender studies. Orlando the novel is semi-biographical, surreally following 300 years in the life of an un-aging young poet. The novel was inspired in part by the life of Woolf’s lover Vita Sackville-West (a VERY interesting person whom you should read more about), as well as by the complex nature of their own relationship. Orlando is a struggling young poet who is having an affair with the elderly Queen. After the young man is jilted by a Russian princess, he escapes England as ambassador to Constantinople. Following a disastrous attack, Orlando falls into a deep sleep and emerges from this chrysalis transformed into a woman. Upon realizing the power she has at her disposal as a woman, she continues to live her inexplicably long life alternating genders at her pleasure. Centuries later Lady Orlando finally completes The Oak Tree, a poem she began as a young boy. The name Orlando itself conjures allusions of Orlando furioso (1532), an Italian epic poem by Ludovico Ariosto which inspired the opera by Vivaldi, and was itself inspired by the legendary French knight Roland. That Italian poem was a study in dichotomies, of unrequited love and the struggle between Christendom and “the Infidel,” of the female warrior and her Saracen lover. Archetypal European stuff here, though not without its own subversions. Even so, Woolf’s gesture in 1928 remained quite radical, for Lady Orlando to find power in femininity all the while claiming the agency to create herself as she wishes, not content to let herself be defined by others. The mechanics of the tracks lend themselves to accompanying the rhythm of reading. Repetition is often foregrounded, and when it is lacking there tends to be at least a steady pulse. The album begins with a track credited to con_cetta, predictably beginning with the ‘male’ half of the equation. “All sorts of petty tyrannies” begins with slow swells, but piano enters and before long a glockenspiel melody carries the introduction to a happy conclusion. The melancholy sets in with MonoLogue’s first track, an atmospheric minor key piano progression of “Tepid Conviction.” Narrative mood remains central without being overly tied to the progression of the novel. One can’t complete a reading of the novel in one play of the album, and though the progression is consistent with the narrative of the album it doesn’t feel out of place cycling over and over again. As was the case with Vita Sackville-West, wealth and class certainly helped in insulating England’s elite from scrutiny of their sexual preferences. But as Morris B. Kaplan argues in Sodom on the Thames, the social performance of gender and of sexual identity may matter more to the perception of sexual identity than any act. Orlando is able to complete her long procrastinated poem only after learning to hold her own, and socialize, with the great poets she set herself in opposition to. Con_cetta and MonoLogue “face off” here, alternating tracks that nonetheless feel deeply collaborative, like flip sides of the same coin. Perhaps the billing is mere superficiality to emphasize the dual nature of the album and the novel. Certainly each has their own style, though especially as the album progresses the distinction becomes blurrier. Orlando is remarkably coherent and serves as a more than suitable soundtrack for reading this quite accessible and influential work.